There are a lot of small scale collectibles found throughout Walt Disney World. These aren’t fifty-dollar figurines or several hundred dollar pieces of art work, no these items are souvenirs that are small, easy to transport, and don’t cost all of your spending money in a solitary item. When discussing these collectibles, most people immediately think of Pin Trading or the recent additions of Vinylmations. Today, however, we’ll look at an affordable collectible that is not only pleasant to look at but also have a very high play value. For as long as can be recollected, youngsters have loved anything that travels on wheels: scooters, bikes, wheels with a stick, and, of course, Matchbox/Hot Wheels cars. Several years ago, Disney introduced its own line of miniature cars called Disney Racers. They follow the model of the 1/64 scale die cast metal body race car, but that is where the similarities between Disney’s wheels and other cars end. Disney’s Racers use well known characters as the inspiration of their cars’ bodies. While Mickey and the gang are included in the various lines (Mickey does, in fact have two versions modeled after himself), the real draw here are the clever and quick heroes of the silver screens. Indiana Jones, Kermit the Frog, various Star Wars individuals, and the crews of Pirates of the Caribbean have all been given the Racers treatment. While it is true that all of these features have a presence in the parks, characters exclusive to the parks have also gotten in on the fun with Racers featuring Figment, Dinosaur’s Carnotaurus, and even a ghost from the Haunted Mansion. Not to be outdone, the already speedy transportation of Disney is also featured with a Monorail and a Disney Bus. The upside for Disney souvenirs, but the downside in the world beyond the gates, is the price tag of the Disney Racers. Retailing for 4.95, the cars make a cheap souvenir, but the price doesn’t hold up against the .97 cent Hot Wheels found in stores everywhere. 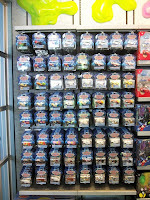 However, when most Walt Disney World art forms, including Pin Trading and Vinylmations, are more expensive and include limitations, such as the blind packaging of most Vinylmations or pins that are only released to Cast Members, the Disney Racers are readily available throughout the parks at a reasonable cost. Not to mention that it could be argued that each car body is as detailed as any attraction queue in Walt Disney World and just as gorgeous. Whether a toy that will be lovingly demolished through the play of a six year old, or carefully included in an artful display, the Disney Racers appeal to a broad range of guests. They have raced under the radar for many years, but that doesn’t mean that they are any less worthy of the time and attention lavished upon other Disney collectibles.